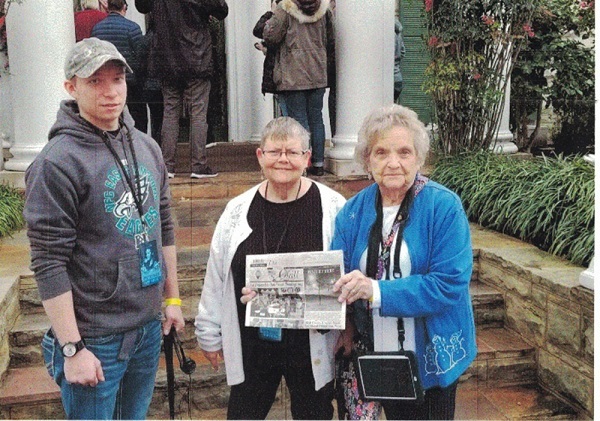 In December 2018, Elvis Presley fans O'Kemm Dixon, daughter Lisabeth from Burlington, IA and grandson Andrew Gapen of Carman took "The Quill" along to Memphis, TN. O'Kemm and Lisabeth had been there before but it was a first for Andrew. They are all Elvis fans. This was a first on the road trip for Andrew who suffered a serious accident in July 13, so it was a long ride for him. They went to Graceland for the Holiday Concert weekend and stayed at the beautiful Guest House next door to Graceland. The Holiday Concert included three shows: Christmas with Elvis at Graceland, An Elvis Gospel Christmas, Live at Graceland including live the Blackwood Brother and Stamps Quartet and Elvis Live in Concert with All Star Band featuring guitarist James Burton and the Legendary TCB Band. They felt Elvis was in the room with them. Andrew said this is History...it was a moment to never forget.